Are typically traditional with the some instrument introduction Said modern as the saxophone and the dip. - Also known under the name of drum, especially use like instrument of percussion in the dance of “Touareg”. - Instruments used typically by “bedoueneses” of our region. Constitute solely of goat skin, in the treaty qualities of unequal percussion. - Made of cane has sugar dries that resembles has the flutter but in the sound is typically Algerian (utilised as music Rai). Instruments in metallic pair that of part materials of which it is manufactured the sound becomes a tempo for the set of group it. It is always the maâlem which plays Guembri, on which it interprètre of the specific particular melodies to each melk (supernatural entity which comes to overlap had). Each follower can be had only by same the melk and can be had only if the melody is played by the guembri. Seven colors are associated different the mlouk and are made visible by scarves which are in particular used to retain the dancers when the possession is too intense. 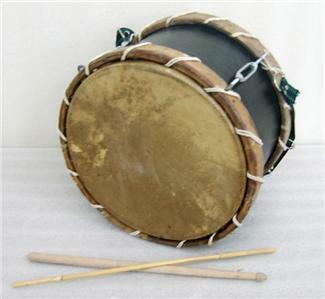 Also known under the name of drum, especially use like instrument of percussion in the dance of “Touareg .